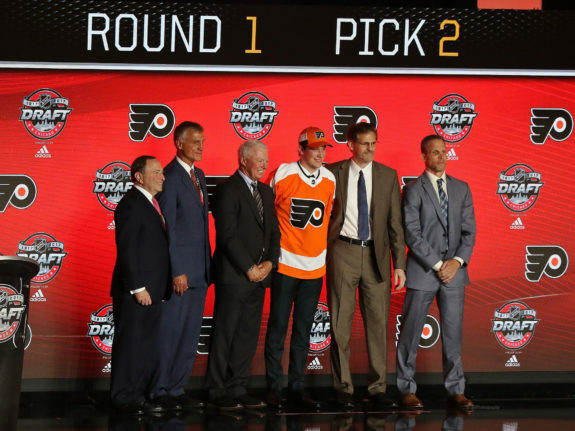 For fans that don’t follow college and junior hockey as intently of our great staff at The Hockey Writers, when the NHL Draft rolls around and we start hearing names called, some of the first reactions are generally: is he related to so-and-so? Well, here I am to connect all of the dots for those that aren’t sure if so-and-so is related to a former NHLer as we give you the most notable additions to the NHL family after the 2017 NHL Draft. Nolan Patrick, Philadelphia Flyers: his father Steve was drafted and played 250 NHL games for the Buffalo Sabres, more well-known was his uncle James who skated in over 1,000 NHL games with the New York Rangers, Hartford Whalers, Calgary Flames, and Sabres. Elias Pettersson, Vancouver Canucks: his brother Emil was drafted 155th overall by the Nashville Predators in the 2013 NHL Draft and spent this past season in the Swedish Hockey League. Cal Foote, Tampa Bay Lightning: his father Adam was a bruising blueliner who’s name can be found two times on the Stanley Cup (1996, 2001 with the Colorado Avalanche) and played in over 1,000 NHL Games with the Quebec Nordiques, Avs, and Columbus Blue Jackets. Pierre-Olivier Joseph, Arizona Coyotes: his brother Mathieu was selected by the Tampa Bay Lightning in the 2015 NHL Draft (120th overall) and spent this past season in the QMJHL with the St. John Sea Dogs. Marcus Davidsson Buffalo, 170th overall, round 6: Jonathan Davidsson CBJ: It’s not often that two brothers get drafted in the same year, but that’s exactly what happened at the 2017 NHL Draft with the younger Marcus going first and then his older brother towards the end of day 2. To our knowledge (correct us if we are wrong) this is the first time brothers were selected in the same draft year since another pair of Swedes were taken in the 1999 NHL Draft — Henrik and Daniel Sedin. Gustav Lindstrom, Detroit Red Wings: his uncle Marcus Ragnarsson was drafted 99th overall by the San Jose Sharks in the 1992 Draft and played 632 NHL games in his career with the Sharks and Philadelphia Flyers. 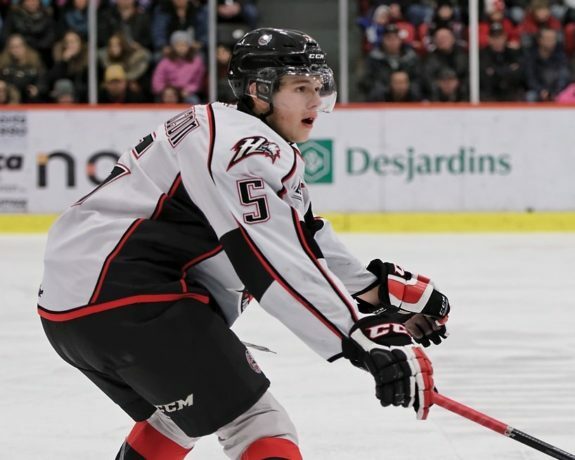 Zachary Lauzon, Pittsburgh Penguins: his brother Jeremy was the 52nd overall selection by the Boston Bruins in the 2015 NHL Draft and was captain of the Rouyn-Noranda Huskies in the QMJHL this past season. Jake Leschyshyn, Vegas Golden Knights: his dad Curtis’ name can be found on the Stanley Cup (1996, Colorado) and played in over 1,000 NHL games with the Quebec Nordiques, Avs, Washington Capitals, Hartford Whalers, Carolina Hurricanes, Minnesota Wild and Ottawa Senators. Cale Fleury, Montreal Canadiens: his brother Haydn was selected seventh overall by the Carolina Hurricanes in the 2014 NHL Draft and played in the AHL this past season with the Charlotte Checkers. Michael Anderson, Los Angeles Kings: his brother Joey was drafted last year by the New Jersey Devils (73rd overall) and won a gold medal with Team USA at the most recent World Junior Championships in addition to playing collegiately at University of Minnesota-Duluth last season. Matthew Strome, Philadelphia Flyers: following in the footsteps of the Staal brothers, we now could potentially have three Stromes in the NHL. The eldest Strome, Ryan (5th overall, 2011 NHL Draft) has played in 258 NHL games thus far and was recently traded from the New York Islanders to the Edmonton Oilers and Dylan was drafted third overall by the Arizona Coyotes (2015) and helped the Erie Otters win the OHL championship in 2017. Olle Eriksson-Ek, Anaheim Ducks: his brother Joel was drafted 20th overall by the Minnesota Wild in the 2015 NHL Draft and had seven points (3g-4a) in his first fifteen NHL games last season. 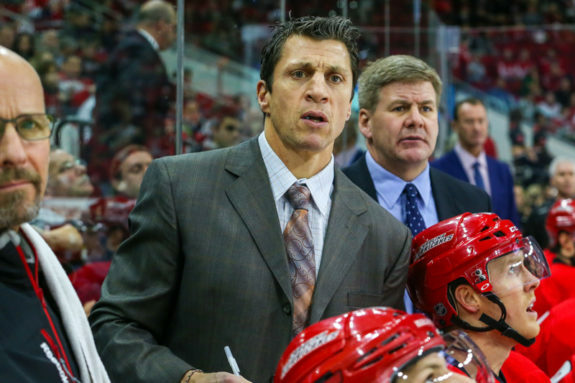 Skyler Brind’Amour, Edmonton Oilers: his father Rod compiled over 1,000 points in 1,484 games with the St. Louis Blues, Philadelphia Flyers, and Carolina Hurricanes; he captained the Canes to the franchise’s first Stanley Cup in 2006. Cayden Primeau, Montreal Canadiens: his father Keith played 909 NHL games with the Detroit Red Wings, Philadelphia Flyers, Hartford Whalers and Carolina Hurricanes. His uncle Wayne played in 774 career NHL games with the Buffalo Sabres, Calgary Flames, Pittsburgh Penguins, San Jose Sharks, Boston Bruins, Tampa Bay Lightning and Toronto Maple Leafs.